Personal Injury Attorney Dallas | The Ashmore Law Firm, P.C. Injured in an accident? Victim of someone's wrong doing? Personal Injuries can be devastating to a family. We represent accident victims from all over the state of Texas. 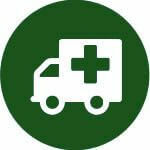 Personal Injuries may include anything from vehicle accidents to medical malpractice, slip and fall to wrongful death. Each year hundreds of thousands of people are injured. Our lawyers will investigate such matters to determine all persons responsible and will diligently pursue the case until it is resolved.